Although technically bottling refers to storing in glass bottles and canning refers to storing in tin cans, in practice the term canning is used in N America to refer to bottling. Home bottling was generally in use in Britain from the early 1900s, however during the second world war the Americans sent over a number of domestic canning machines but eventually the cans ran out and people just went back to bottling. We’re not aware of anybody selling domestic canning machines in the UK although they may still be available in the USA. However, names stick and our American readers should just think ‘canning’ where we say ‘bottling’. The preservative method of bottling is straightforward. The produce is heated to kill off any microbes in either a syrup, for fruits, or a brine for vegetables and then sealed to keep out new microbes and exclude oxygen. The concept goes right back to the Greeks and Romans who discovered excluding air was a key to keeping foods edible for long periods. However, excluding the air is not as easy as it seems and spoilage rates were very high compared with modern standards. The process of bottling was perfected in 1809 by a Frenchman, Nicolas Appert, who won a prize of 1,200 Francs offered by Napoleon who needed to supply his armies. A year later an Englishman, Peter Durand, adapted the process. He placed wholesome food in clean metal containers, which were then sealed and boiled long enough to kill the spoilage-causing bacteria. These were similar in shape to tea canisters and the name ‘can’ came into common parlance. Whilst the process is very effective, things can go wrong. 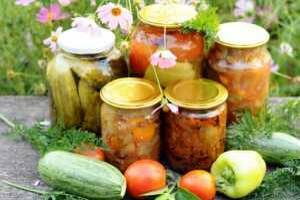 As with all food preservation, hygiene and attention to detail are critical for successful and safe storage. One obvious risk is the seal breaking and allowing microbes access to the food. These will develop and produce gas, often leading to an increase in pressure. With commercial canned goods where the tin has been damaged, a sure sign the contents are spoiled is the can swelling. In the grocery trade, they’re known as ‘blown’. If you open a home bottled jar and there’s a release of pressure, the food is spoiled. Usually the obnoxious smell will make this very obvious but please don’t trust the food even if it smells OK. Always double check the seal on the lids is tight the next day when the jars are at room temperature. The way to do this is to carefully undo the clips or unscrew ring sealed jars and then gently lift by the lid. If there is a good seal, the lid will stay on due to the vacuum in the jar. Where you are using the thin metal lids, check if the centre of the lid can be depressed. If it is flexible then it has not sealed correctly and will spoil. Although bottled produce will store well, light can cause discolouration so store in a dark cupboard. One day someone may start selling dark glass preserving jars, buy them!